"We know, we know -- Windows 8 isn't splashing down on consumer devices for a good long while, but seriously, how's a boy to get excited about something that's already old hat? And moreover, something that has never, ever worked out. Every single Windows 7 tablet that we've tested has suffered a similar fate: too bulky, too sluggish, not longevous enough and too difficult to to operate sans a keyboard and mouse. That said, Lenovo's providing a darkhorse option for those uninterested in its duo of new Honeycomb tablets, with the IdeaPad Tablet P1 bringing Windows 7 into a familiar 10.1-inch shell." 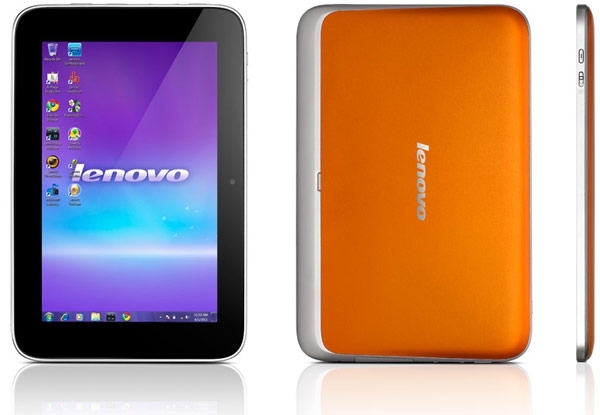 Going where others have basically failed, Lenovo has introduced a Windows 7 tablet. The IdeaPad Tablet P1 sports an Intel 1.5GHz processor, a 1280x800 10.1-inch capacitive screen, up to 2GB RAM, up to 64GB of SSD storage, WiFi and 3G (WCDMA/EVDO) , a USB "connector," microSD slot, bluetooth, stylus input support, a docking port, a 2-megapixel webcam,a 2-cell battery lasting about 6-hours, and in gray or orange (the back). Availability is scheduled for Q4 2011, and no details are available yet on price. Personally I think that there is pent-up demand for a good Windows "business" tablet (me included), so I'll be interested, if it becomes a reality.